A third to a half of the world are introverts. Everyone is a mix of introvert and extrovert but often one is more dominant than the other. Some introvert tendencies are that the person is more reserved, less outspoken in groups, prefers solitary behaviour (like reading, writing, hiking, painting) and their energy tends to expand through reflection and dwindle during interaction. Susan Cain recently did a brilliant TED talk on the power of introverts. I’m definitely more of an introvert and always have been. I prefer to concentrate on a single activity at a time and like to observe situations before I participate. I like to analyze and think deeply before I speak or act on something. I like spending time alone, wandering and thinking, crafting and creating. I tend to get easily overwhelmed by too much stimulation from social gatherings and engagements. So although I’ve always had a burning passion to fight for justice, I’ve always found it hard to fit into traditional forms of activism such as joining large groups, dressing up for public stunts, going on large loud marches chanting and shouting with placards. I am always hesitant to sign a petition when someone asks because I want to have a long thoughtful discussion before I decide to sign it, and I get nervous asking others to join a campaign because I’m naturally shy (which is more to do with fear than introversion). I turned into a burnt out activist and believe that a lot of that stemmed from my feeling cheap online pharmacy reviews drained doing traditional activism. Craft is a great tool for me because I can do it alone with my thoughts, I can leave up my craftivism pieces in public for people to engage with without me being there. Solitude is a crucial ingredient to my productivity and creativity and crafting alone can help this process as well as create an environment for deep thought. Crafting on my own or in small groups makes me feel much more comfortable to talk about issues, to speak up, discuss issues and listen to other people’s thoughts on the issue. 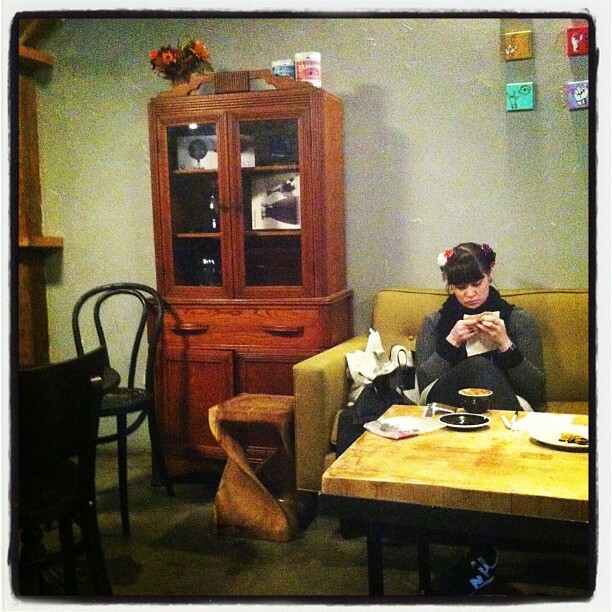 Because I’m naturally introverted and shy, people often could tell that I wasn’t crafting in public to gain attention or to show off but because I am driven to engage people in social justice issues in small interactions because I believe deeply that we should always be reminded to help others or at least not to harm them. This can sometimes have more power than extrovert activism in engaging people. Eleanor Roosevelt, Rosa Parks and Gandhi all describe themselves as soft spoken, even shy and they all took the spotlight even though every bone in their body was telling them not to. 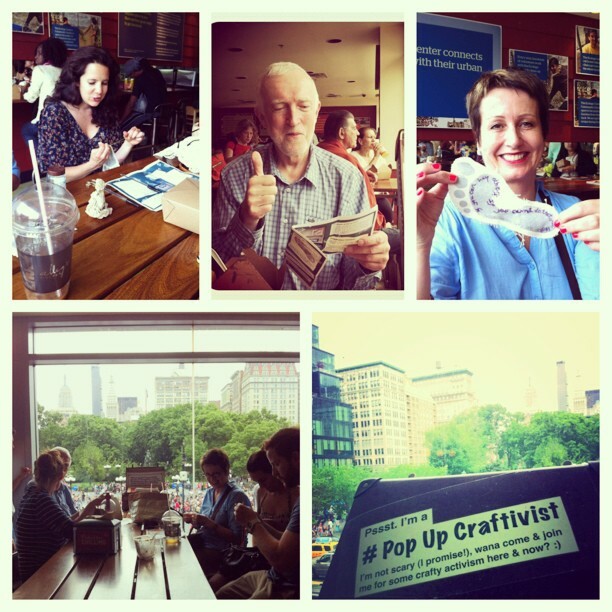 I believe that the Craftivist Collective has grown in to a global collective of people and gained attention in the media because amongst other things it caters to introverts and everyone who has introverted tendencies. It’s activism for the introvert in all of us. So how did an activist cope in NYC? Well I freaked out a bit with my suitcase in Union Square NYC to the point where I wasn’t going to open it but then I decided I should open it and see if anyone wants to talk about craftivism and the footprint activity. I sat stitching which calmed me down and then a lovely older German gentle man (Raemer) sat near me, we smiled at each other and he read the label on my suitcase and then asked what I was stitching. I showed Raemer different examples of our craftivism projects & the crafitvist footrprint project instructions which was the activity of that day. He asked lots of questions about how I got into craftivism, what I do as a craftivist and how he is a retired teacher and would love to show his old school what the Craftivist Collective do. Raemer took a flyer & took photographs to show his son who lives in Berlin. We talked about our love of NYC but also the challenges of staying hopeful and fighting for a better world when it can feel overwhelming and too easy to give up. He stayed for 2 hours chatting to other craftivists who came to join in & even offered to take photos of the group on my camera and camera phone because he said it was important I was in the photographs. Raemer gave me a firm hand shake & a beaming smile when he left and told me to keep ‘shining’ and leaving ‘beautiful footprints on the earth’. You too Raemer! 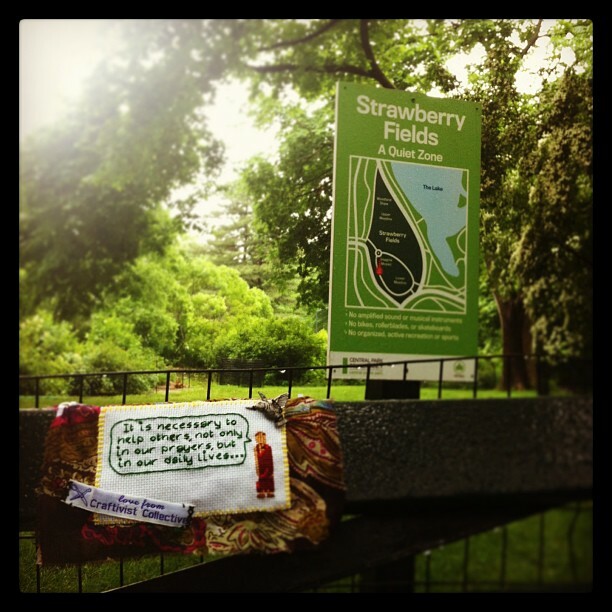 My mini protest banner in Strawberry Fields, Central Park, NYC. A quick reblog, for extroverted introverts, like me, everywhere.